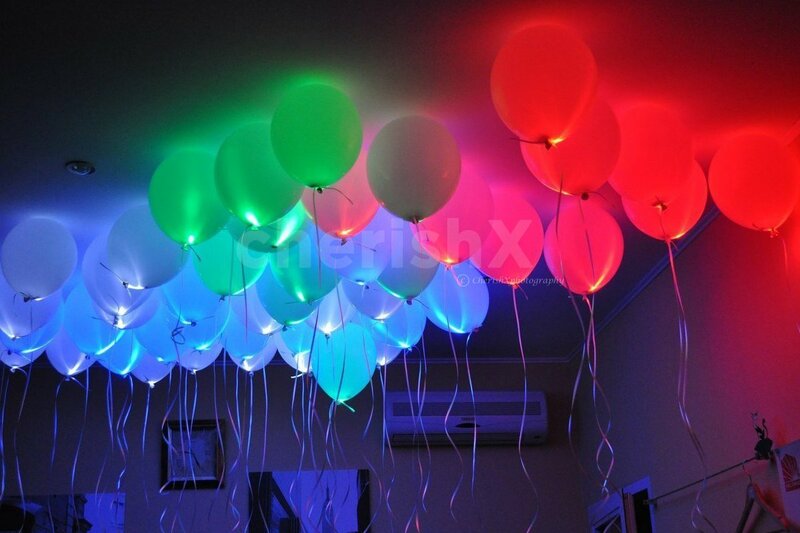 Light up your birthday party at home with this gorgeous LED Balloon Decor! All about love, positivity and party spirit! Is your loved one or child’s birthday coming up? Are you here just in time for an anniversary celebration? Heighten the epicness of any special occasion with our colourful LED Balloons. Can be used as a decoration and also a home surprise. This package comes with 50 LED Balloons with ribbons stuck to the ceiling using removable tapes. The balloons are air-filled and create the look of helium balloons. Each balloon contains an LED light that will last for 4-6 hours. Not only that, there will be 150 multi-coloured balloons which can be left floating on the floor or done up in the form of bunches on walls as per your choice. The whole surprise will home-delivered to you, and is available anywhere in Delhi-NCR. If this is not enough this package comes with some cool customizations.You can add 100 more balloons in multiple colours, multi-coloured paper pom-poms, a 4-feet tall teddy bear, a private guitarist, and return gift if you’re throwing a party! You can also choose to have printed photos hanging from the balloons, a happy birthday banner, candle and flower decoration, and even a decadent cake. Enhance your regular party with this unique and classy decoration! Decoration is done with mixed colour balloons, each balloon has a LED bulb that lasts for about 4-6 hours. Right after the booking, you will be redirected to a page where you fill all details like address etc. Replace 20 LED Balloons with Happy Birthday Printed LED Balloons.